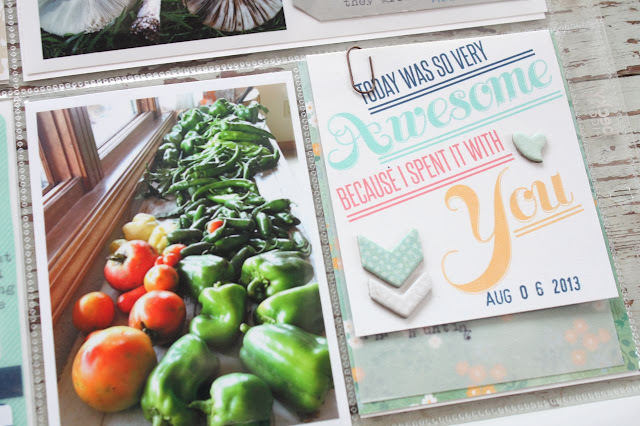 Today I'm sharing Week 32 of my Project Life which has some fun inserts from a mini camping trip and a day of canning jellies. As always, I start with my weekly sketch then print my photos and then get it's on to the fun part of assembling my week. This week I stamped some of the labels from the Gossamer Blue September Life Pages Kit onto my Grid Paper Labels. 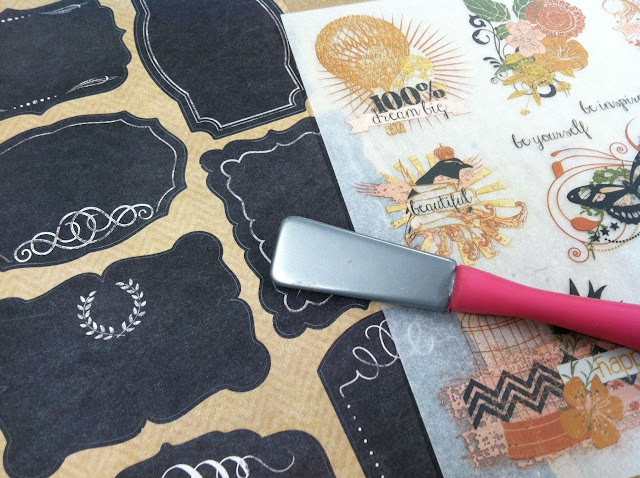 I had Elle design this stamp so it would stamp perfectly onto address labels. 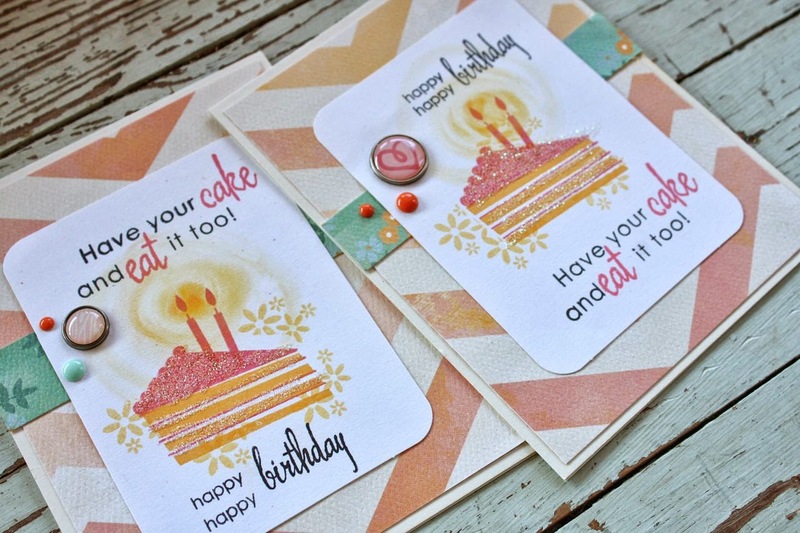 I love having a little stash of these stamped labels in various colors on hand. 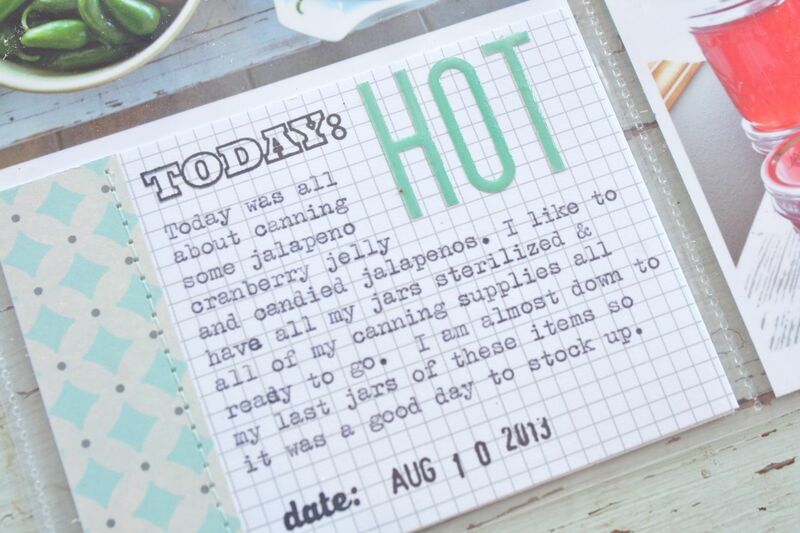 Note: You can fit 3 lines of typed journaling in the "note" section of the label. Here is the main spread without the inserts. I have to stay this September was a favorite month for Gossamer Blue Kits for me. 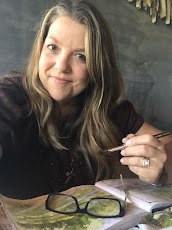 I just loved the color scheme, the product lines that Lori chose and all of the awesome elements from our graphic designers. This week, it was so easy to match up my photos with kit items. I just love how everything coordinates so well. 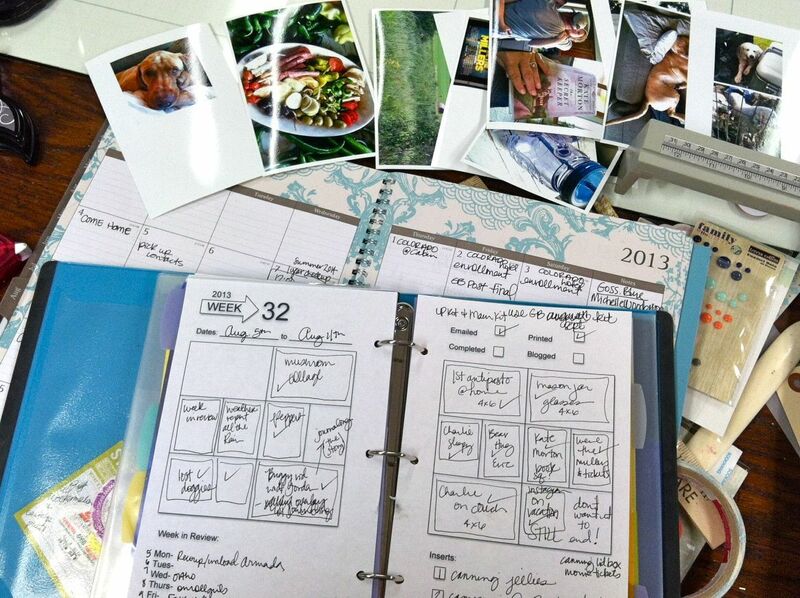 I fit a lot into this week but it all flows nicely and looks cohesive when viewed all at once. This is my Week 32 main, dated insert. 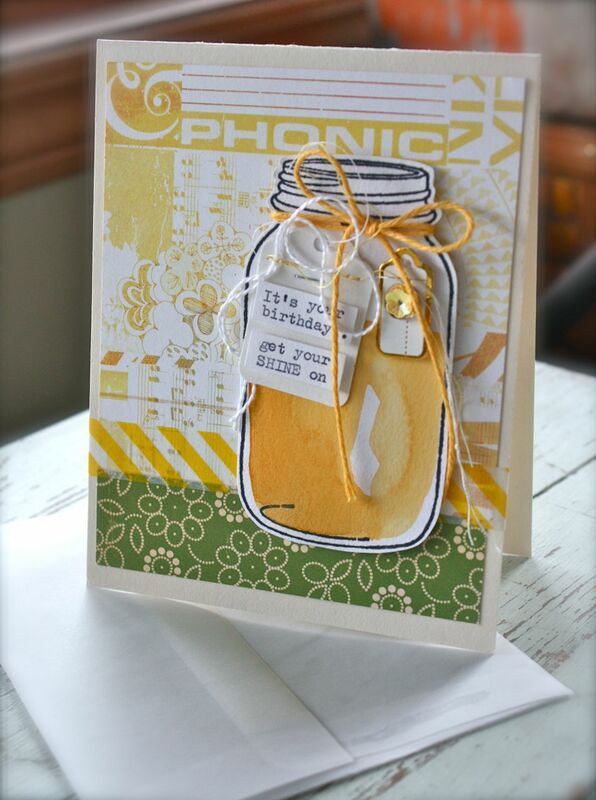 I used handcut paper, stickers and chipboard accents. 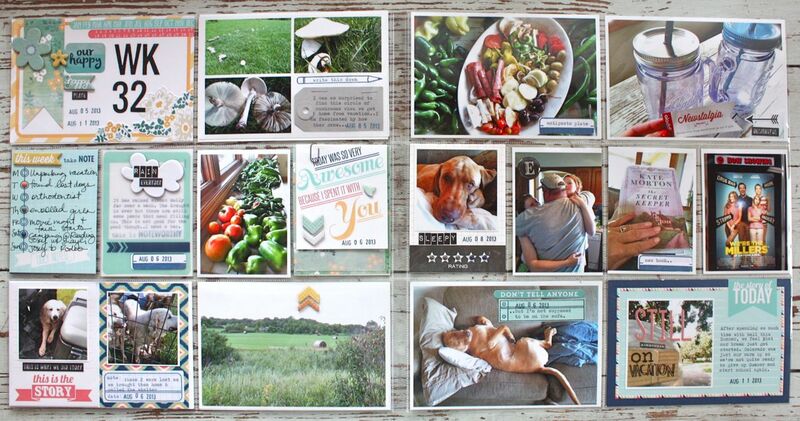 On to the 4 x 6 inserts. These mushrooms were everywhere when we got back from vacation. It rained all week while we were gone and the mushrooms just went crazy. I spent a good long time photographing them and just investigating these little wonders. Here I used 3 x 4 journaling cards created by our graphic designers. 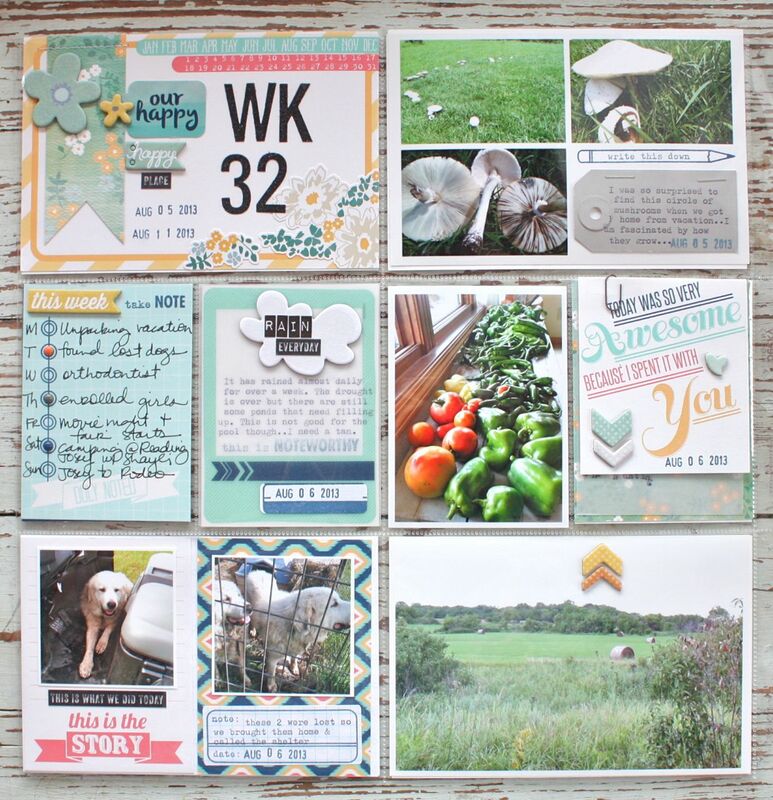 You can see where I used one of the stamped Grid Paper Labels below the square photo on the right. 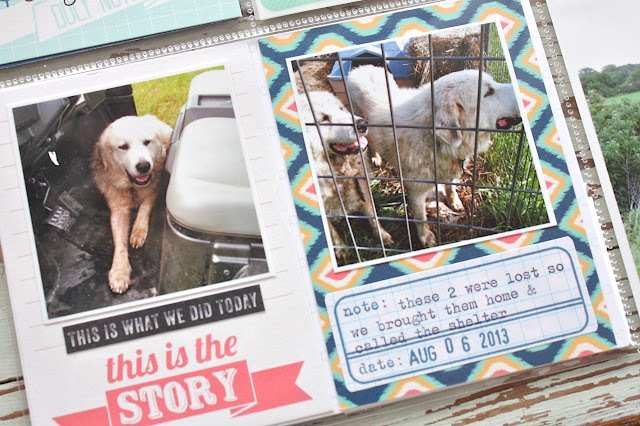 Here I used the rectangle notebook label stamp from the Life Pages Kit. I paired it with a sticker for some fun journaling. I loved the sticker alphabet from September. I used them this time directly on the photo. 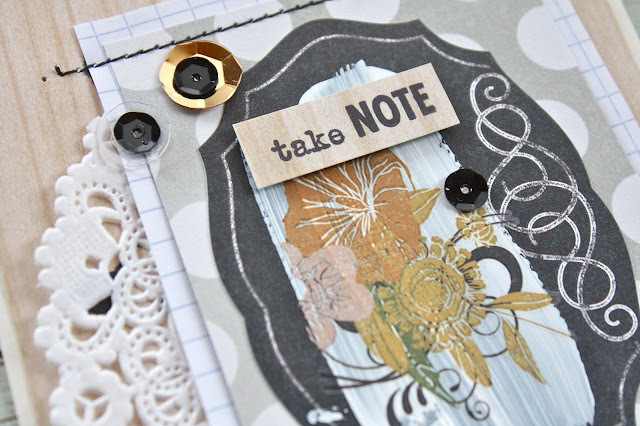 Here I used the dot line stamp from the Life Pages stamp set to make a bullet list. Love those cloud chipboard accents. On the right I trimmed down a journaling card and clipped it to some typed journaling. I loved the little paper clips from last month. More photos accented with enamel dots, sticker letters and an epoxy E.
Here I used the label stamp from the Main September Kit. On to the inserts. I had 2 double sided inserts this month. You can see how they fit in between my pages below. This first insert has some simple 5 x 7 photos from our mini camping trip. This photo of my dad in his jean shorts and boots was just too good. 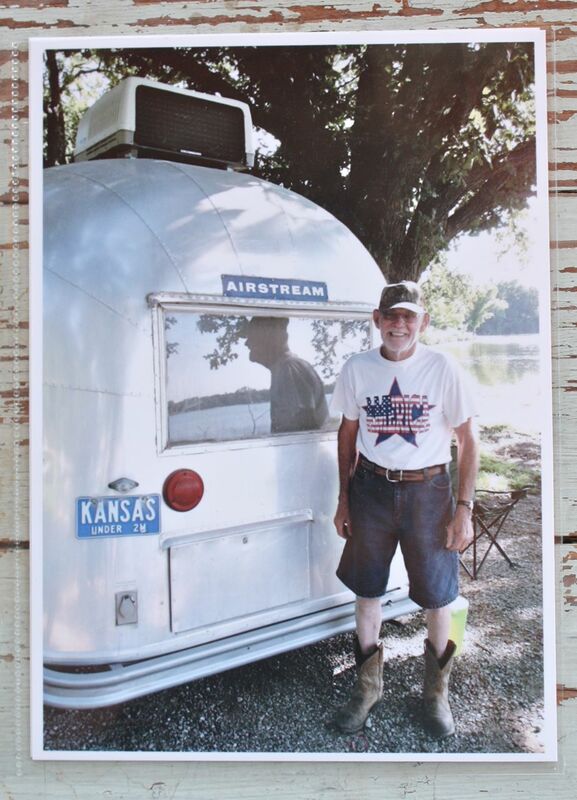 I had to enlarge this photo of him standing by the Airstream. 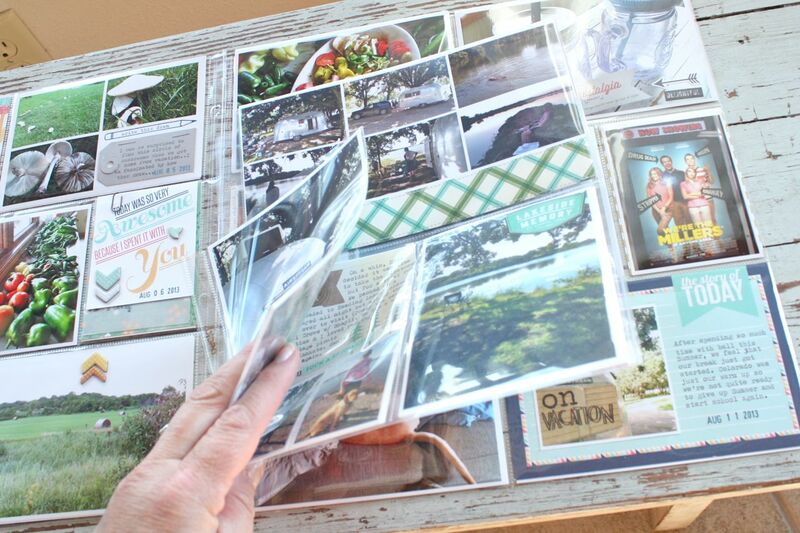 Here you can see the back side of the 5 x 7 insert which has a photo of the Airstream and one of my vintage picnic baskets. 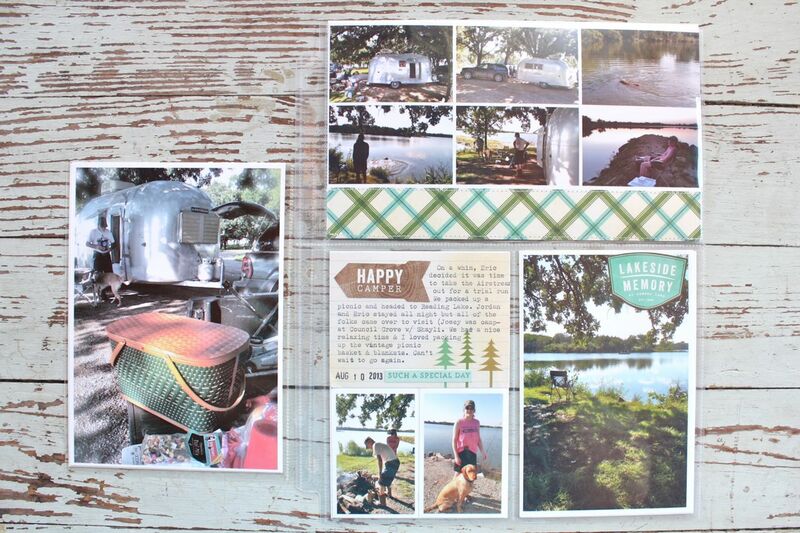 On the right I have the insert which has 9 photos from our camping trip. I used the Pebbles Lakeside line of products for this insert. 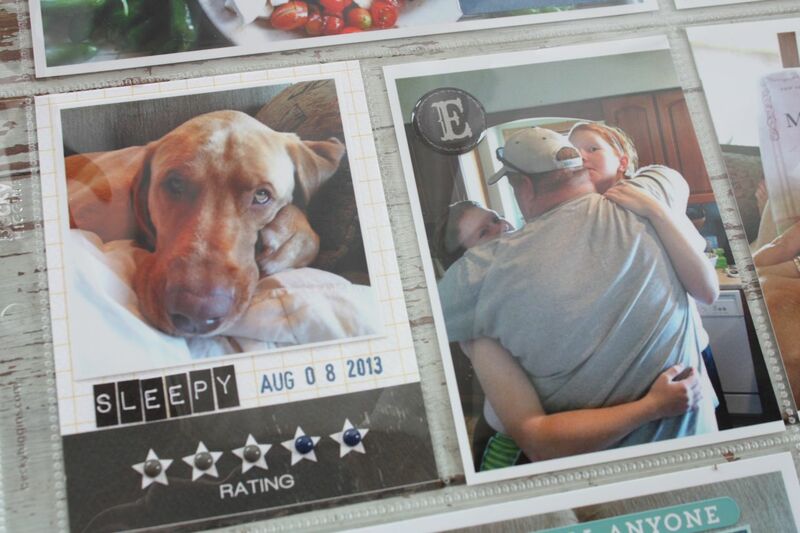 I love that I was able to get all of these photos onto one insert. The plaid papers, the colors and the journaling card were just perfect for this insert. 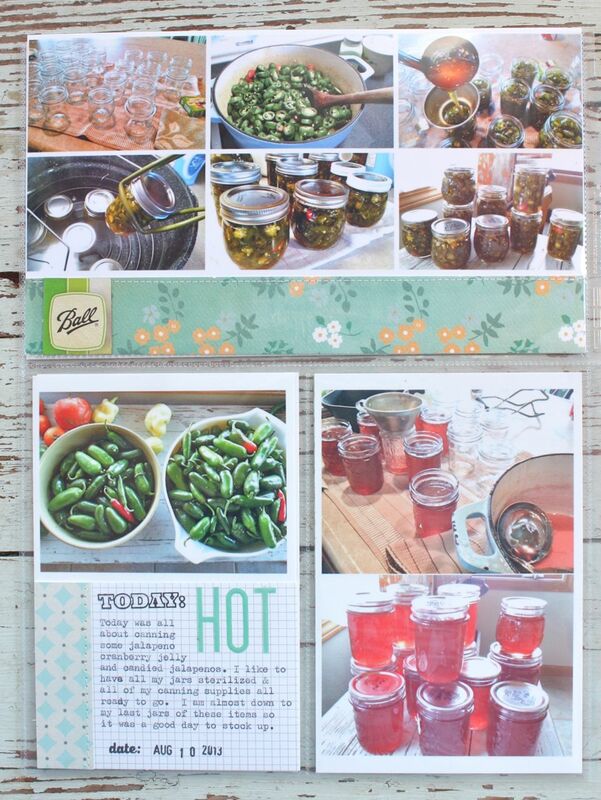 On the back side I captured a day of canning jalapeno jelly. I have a specific way of getting all my canning supplies ready to go so it's fun to capture those photos. Again, I got 9 photos on this insert. 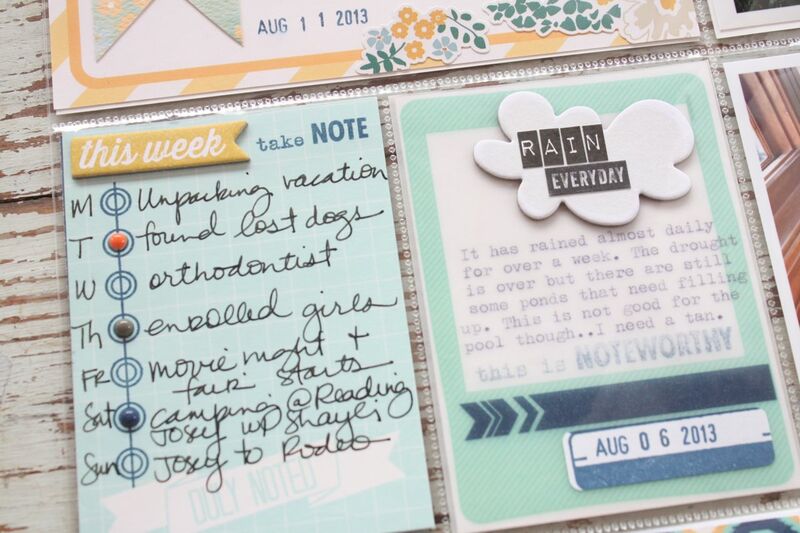 The journaling card was one I created from kit items this month. Now that Summer has passed us by, I love that I captured this fun week. 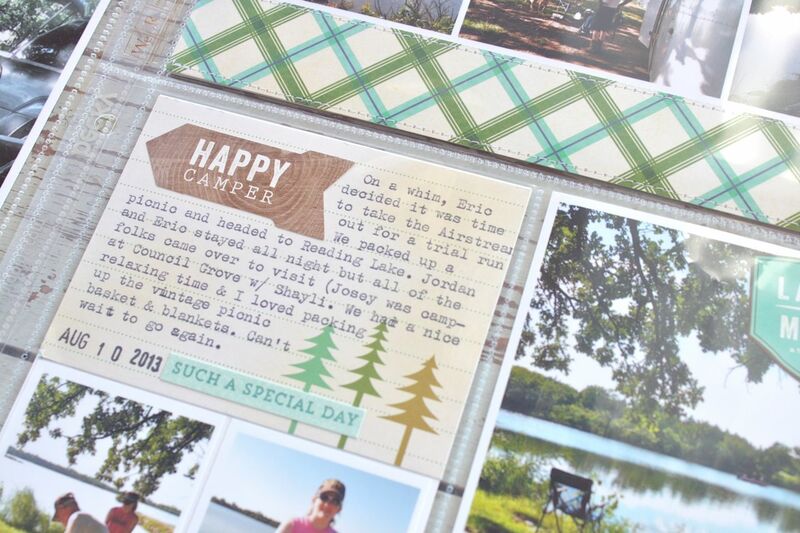 The camping trips and Summer activities will be something fun to look back on when it's freezing this Winter. Hope you enjoy! 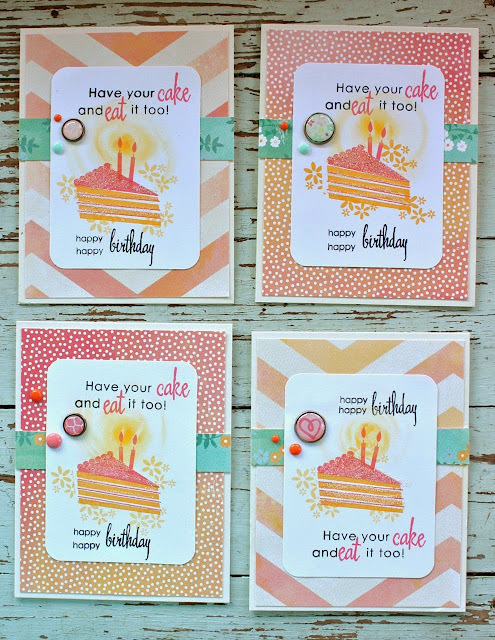 Today I have some birthday cards to share using a Papertrey Ink stamp set, Pan Pastels and some leftover patterned paper from a Gossamer Blue kit. I started out by stamping all the layers of the birthday cake and candles onto a Becky Higgins blank journaling card. 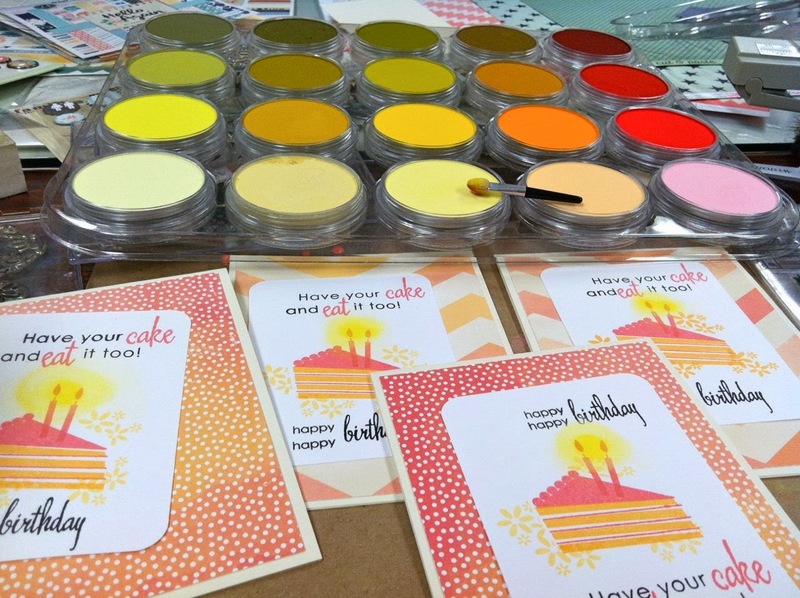 After that I used my Pan Pastels and a small sponge applicator to add the candle glow to all the candles on the cake. Pan Pastels are super soft and blend beautifully. It was so easy to create a soft glow. You can blend with your fingers or use an eraser to remove color if needed. Next I added some fine glitter to the cake. What's a birthday without sparkles, right? I prepped my card bases with pretty patterned papers. 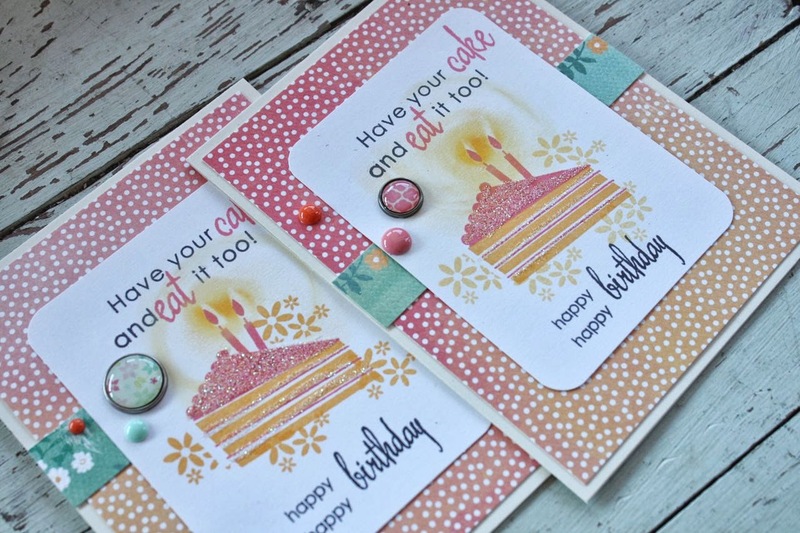 Then I added my stamped layered + brads and enamel dots. 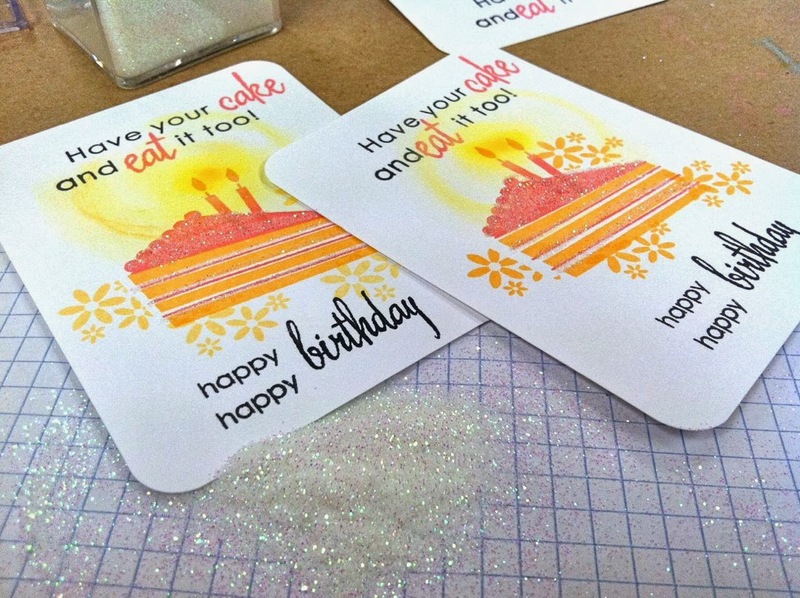 A little bit of glitter, a little bit of dimension + the glowing candles. A fun little stash of cards. 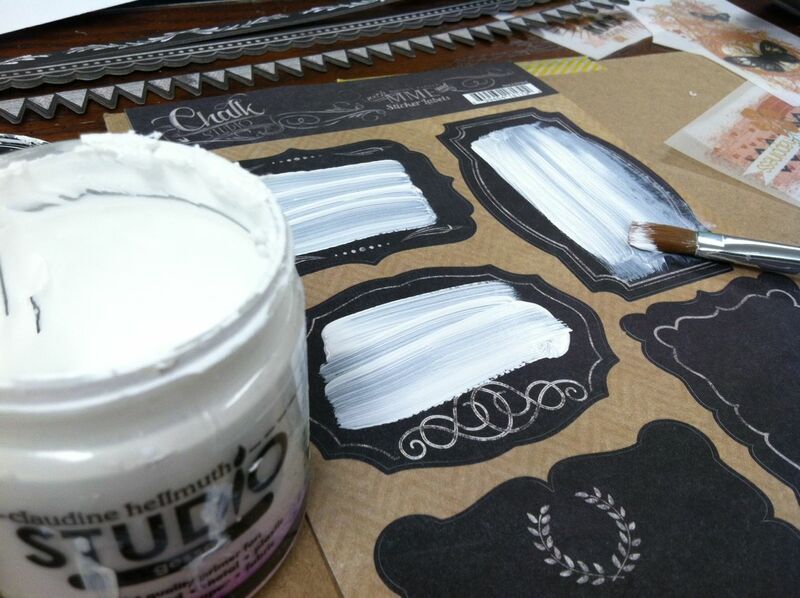 It's so fun to just sit and create.....adding special little touches here and there. Hope you enjoy. One of these cards has made it's way into my shop this morning. I'm clearing out a little of my stash so look for new handmade items all week. Thanks for stopping by. I've gotta run...Charlie gets to go to school today. He had a bath last night and is all soft and smells soooo good. Josey gets to use Charlie as a prop for a speech she is giving today. Lucky Charlie! TGIF everyone. 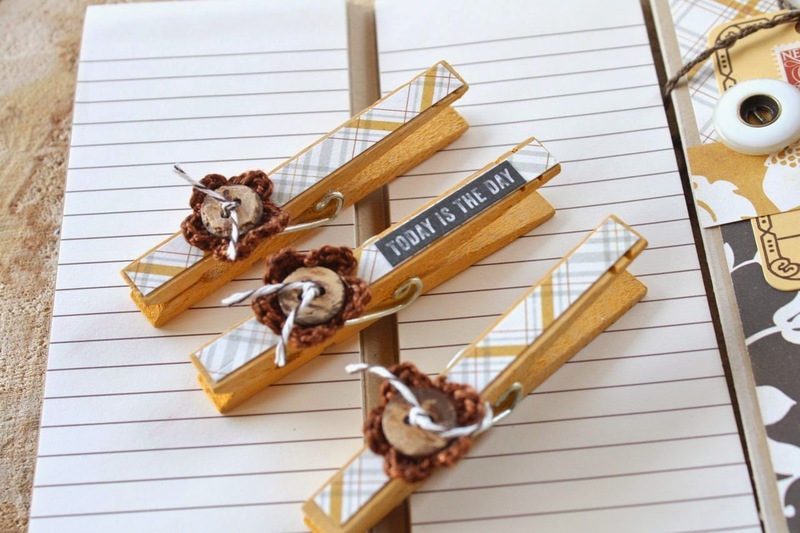 Today I'm sharing some Fall floral notebooks I made with coordinating clothespins. My sister recently had surgery and I thought a little care package was in order. She loves my notebooks and uses them until the covers are tattered and the pages are gone. Here's my lineup of product. 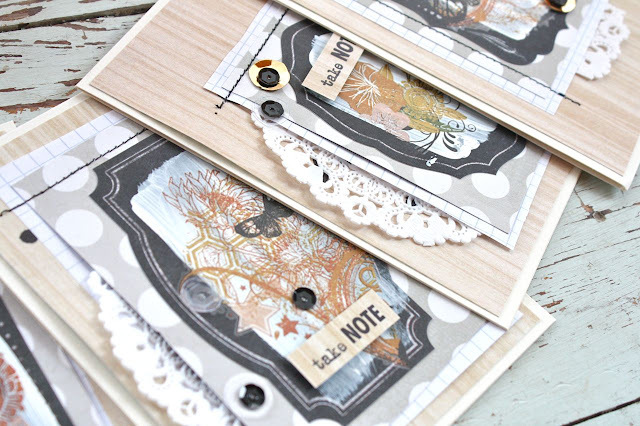 I love the woodland motifs right now like pinecones, wood grain, mushrooms and acorns. Paired with a little stripe and plaid and this was just what I was looking for. 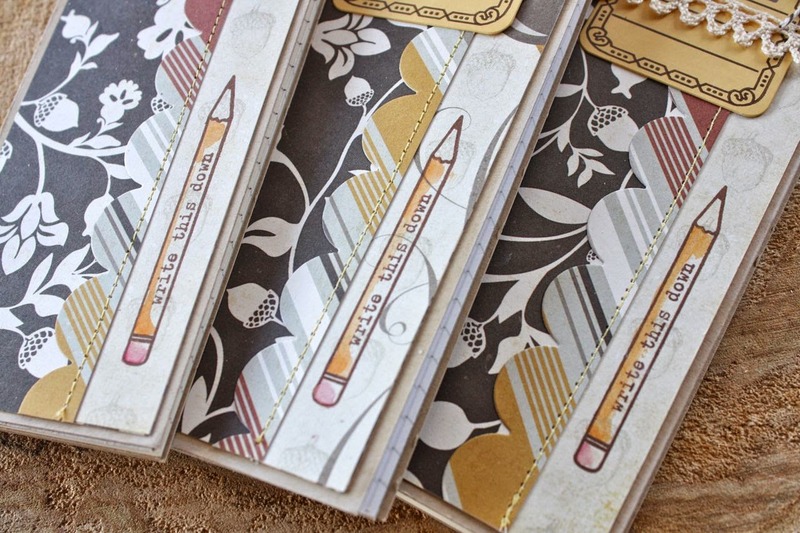 A lovely collection of papers from Echo Park. 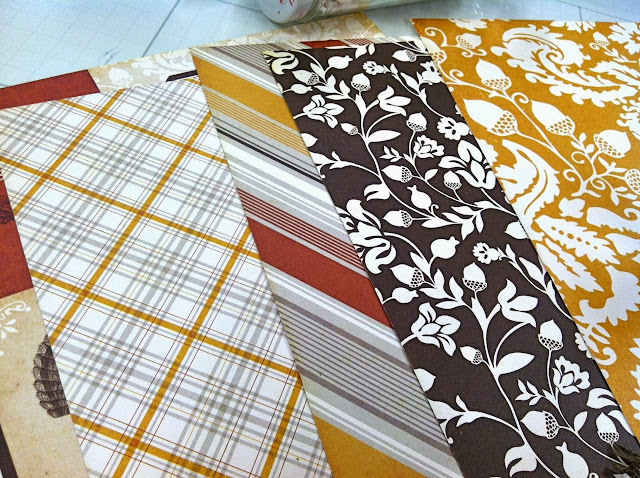 I just want to turn these into fabric prints and make a quilt with them. I started my notebook covers by piecing together some papers and stitching over the top. 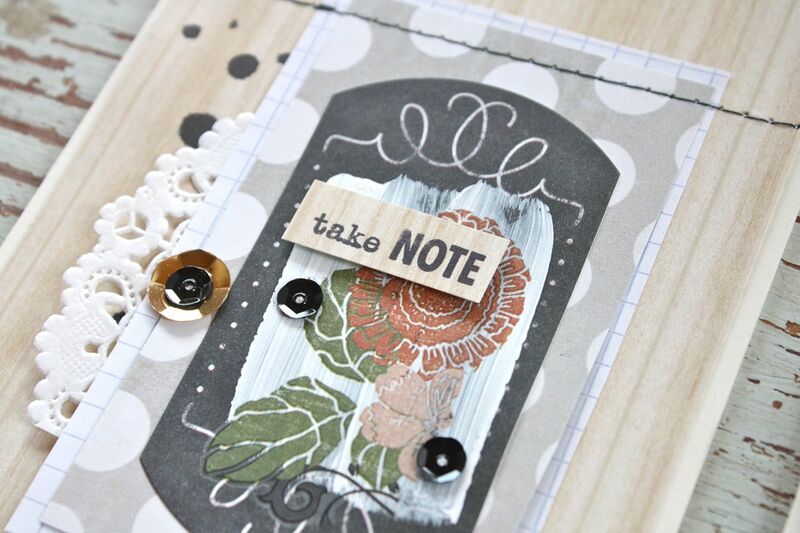 I used the pencil from the September Gossamer Blue Life Pages kit and colored it in with some quick watercoloring. 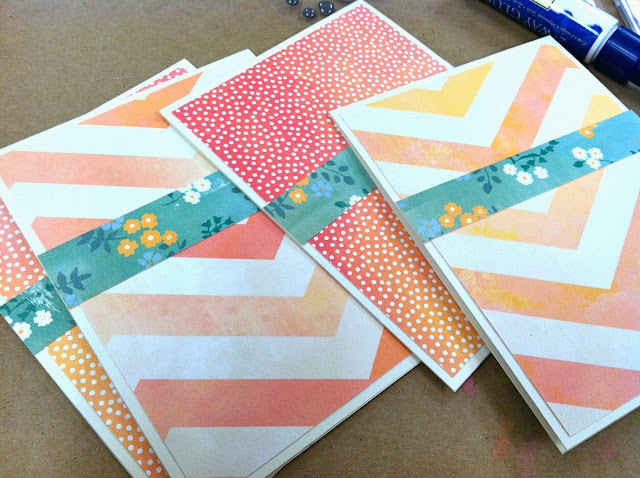 Here are my finished notebooks. I love when a little grouping of crafty projects makes ya so happy. 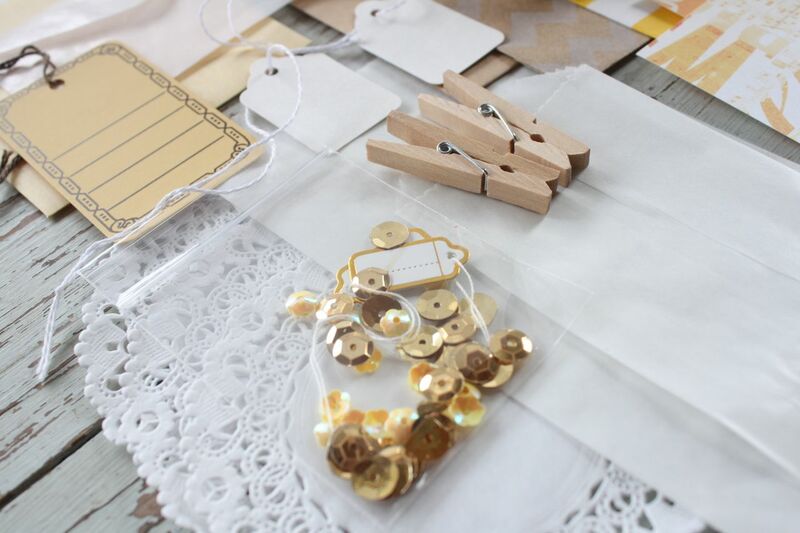 For the cluster of embellishments I used my Printed Hang Tags stamped with more Gossamer Blue stamps, some vintage buttons, woodgrain buttons, crocheted lace and vintage postage stamps. Love how the top stitching and scalloped Papertrey die finishes off the notebooks so nicely. I had some clothespins in my stash that I had hand dyed. 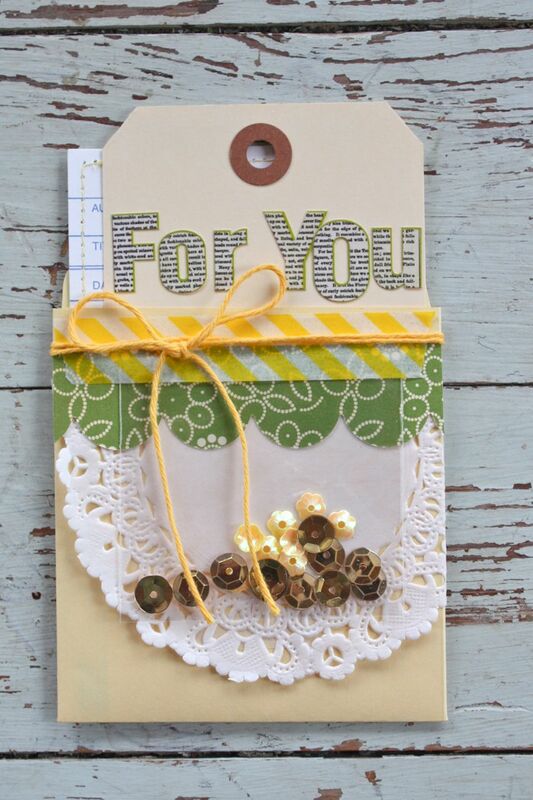 I added some scraps of patterned paper and some little crocheted flowers from my stash. The woodgrain buttons are a favorite. 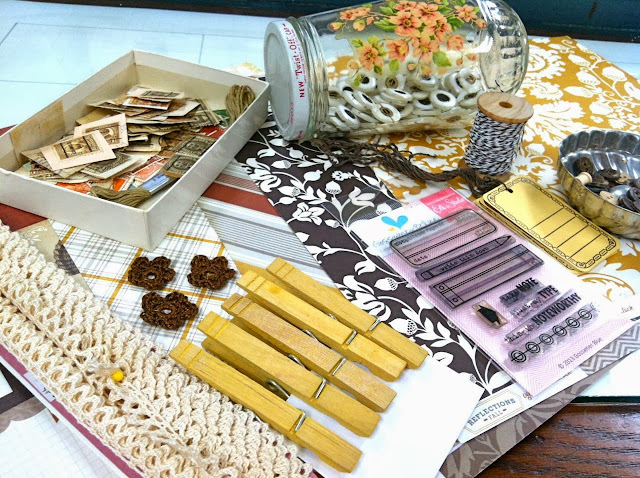 Hope you are inspired to get into your crafty space this weekend, dig out some Fall themed goodies and create something fun. Have a great weekend everyone. 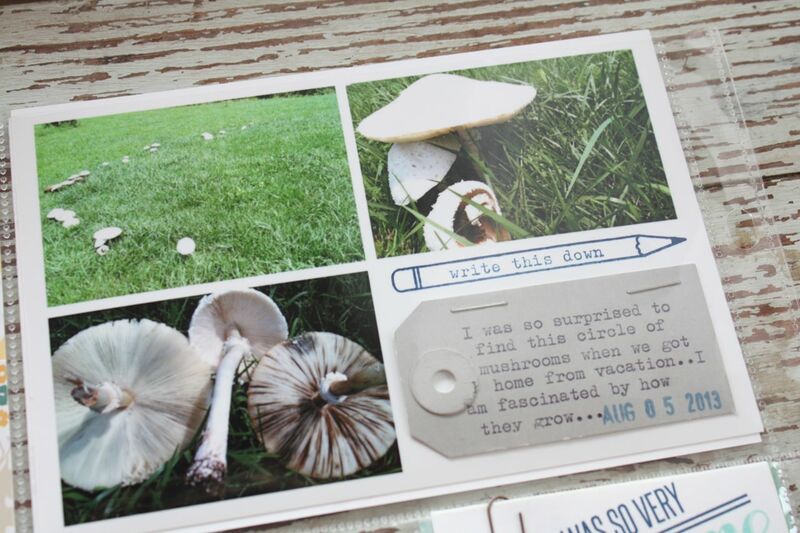 For you super sleuths.....all the woodland themed products lately have me thinking about a book I had a child. It was a Golden book I believe and was about a little boy who was camping with his parents and got lost in the woods. He made a little trail and remembered all the little things he looked at in the woods and finally made his way back. Something like that. 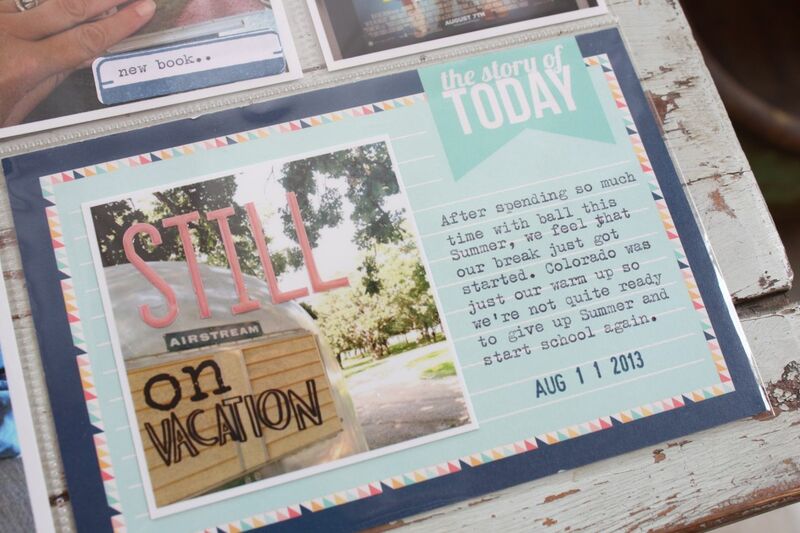 If anyone can tell me the name of the book or has one that I can purchase I would dearly love to have one. Hi everyone, today I have a brand new kit up in the shop called Yellow Jar Kit. 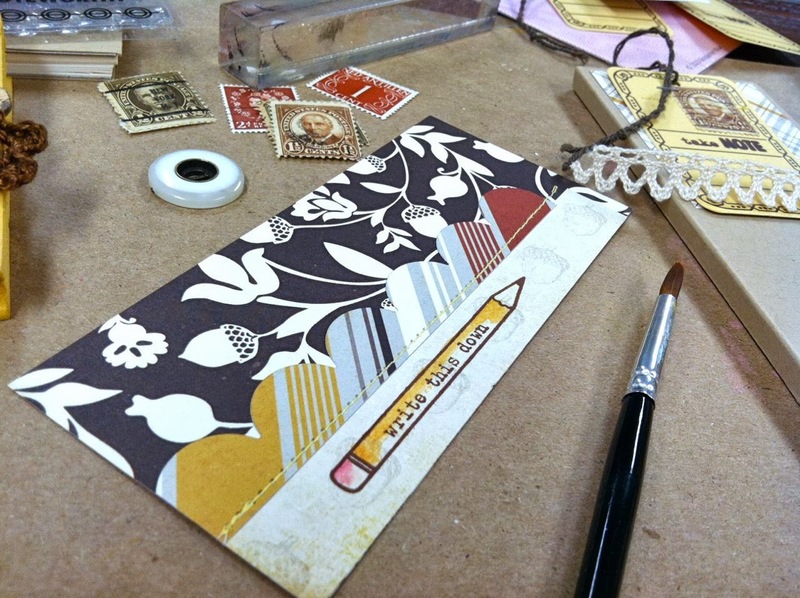 At this time of year I start making more and more cards to add to my stash. 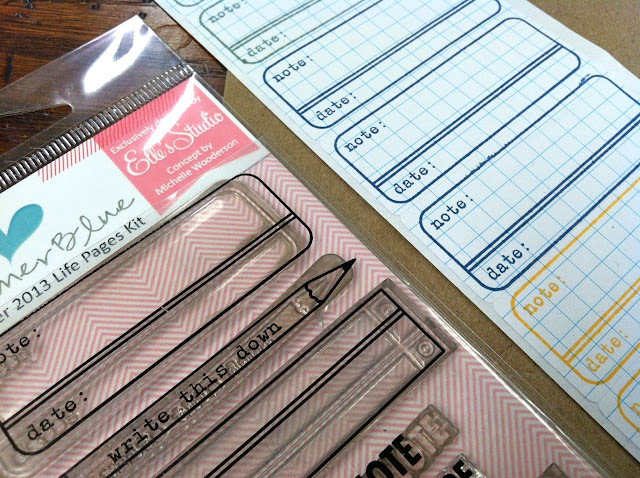 I like to use these as Christmas gifts & package them up in little sets. 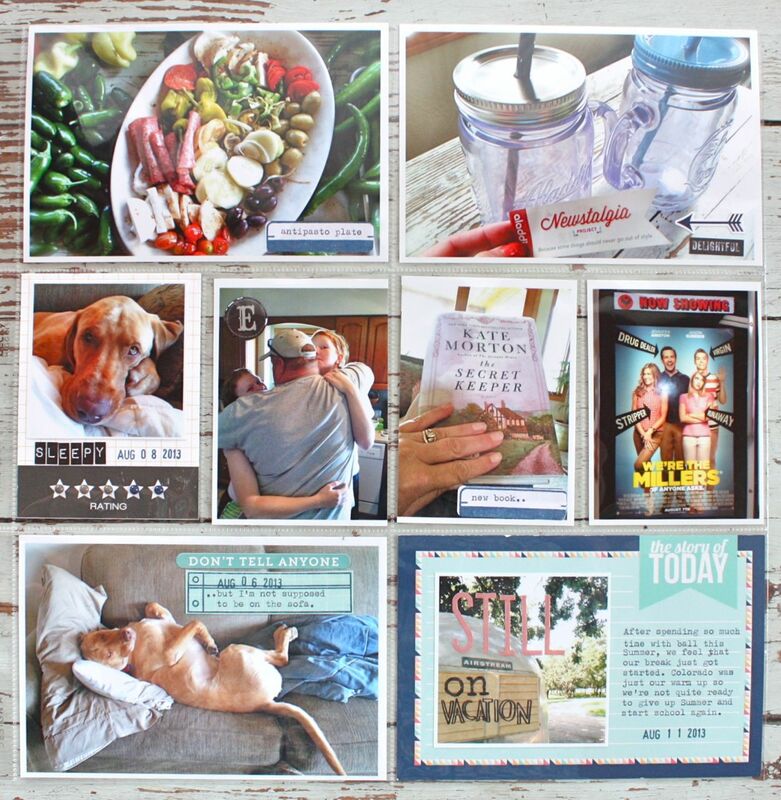 The card gifts are still a hot item and I'm sure my family and friends that receive them every year would be disappointed if the package of cards wasn't there for them. 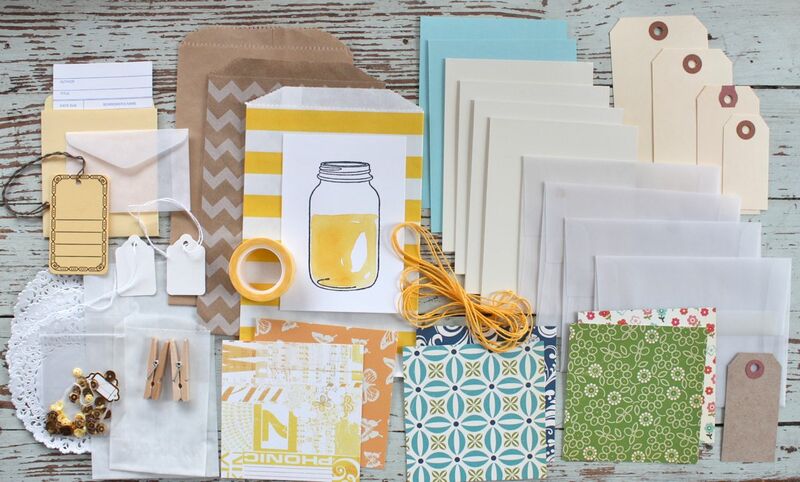 I know many of you like to make cards as gifts too so this kit might be right up your alley. The kit contains card bases, cut patterned paper in many styles, sacks to use as envies or packaging and lots and lots of embellishments. 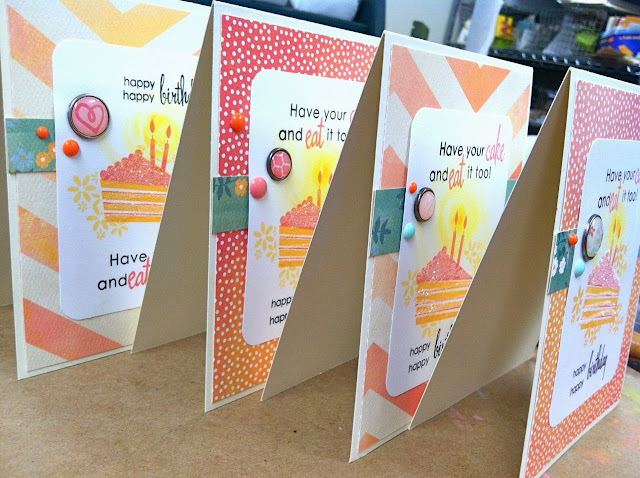 There's enough product to make at least 6 cards which equals out to about $2 bucks a card. 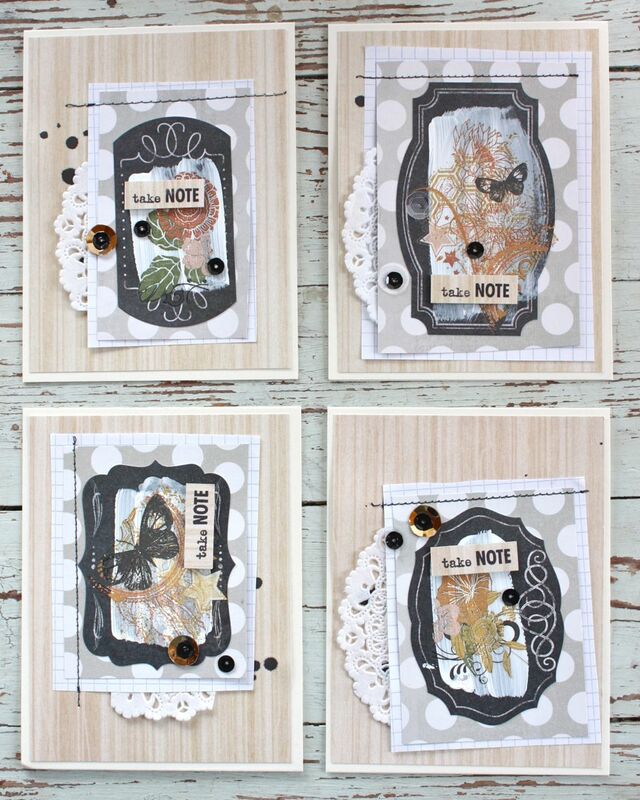 There will be plenty of leftover items to create more cards when combined with your own stamps or scrapbooking/crafty items. I really love the little sack of gold sequins and yellow flower sequins. 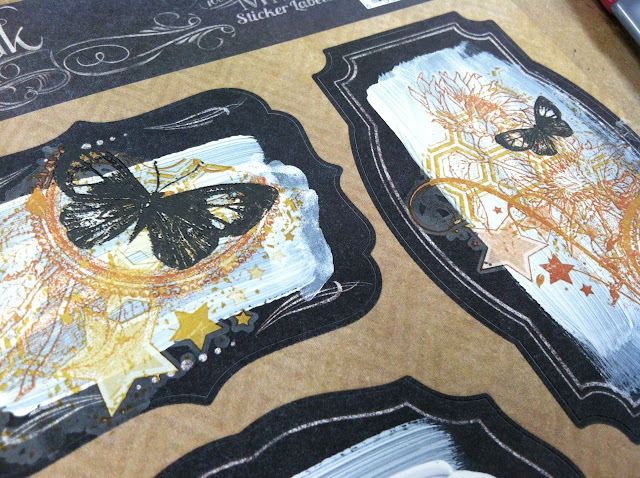 They add such a fun sparkle to projects. 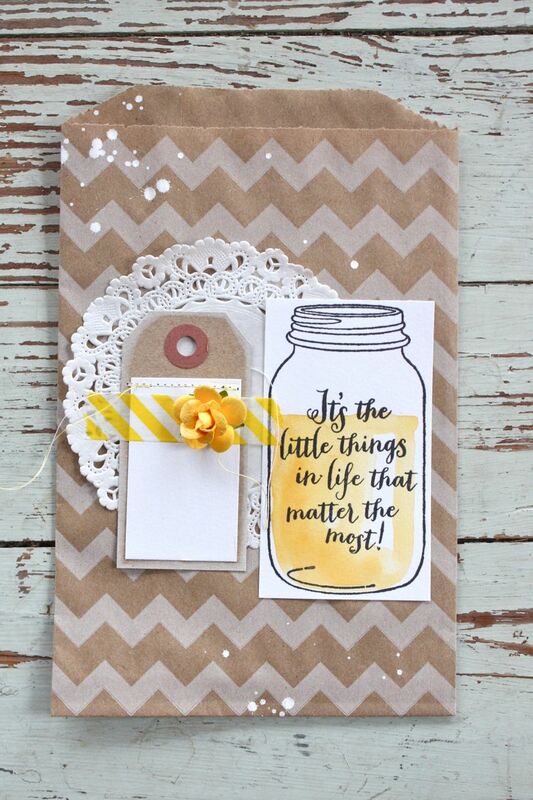 Just for fun I added in a watercolored mason jar. I left the piece of paper untrimmed so that you can use it in various ways. 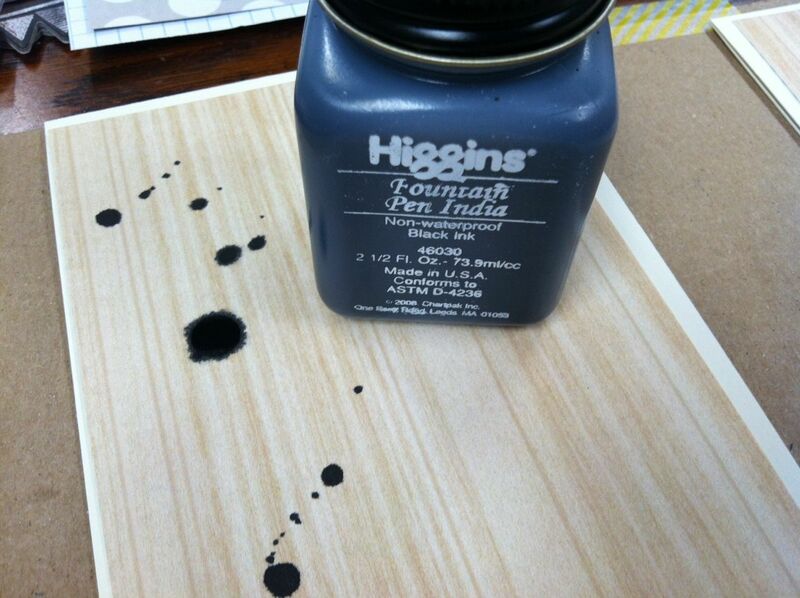 I have some fun samples to show you below. 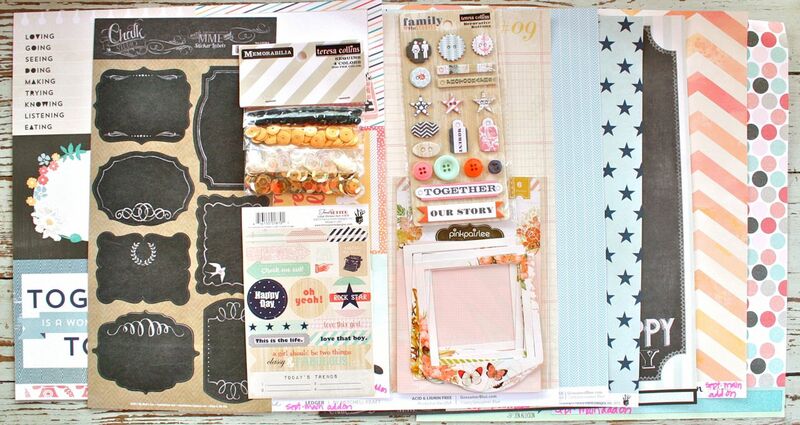 The fun little mix of papers offers lots of variety...they're double sided for lots of pattern choices. There's October Afternoon, Sassafras, and Studio Calico. 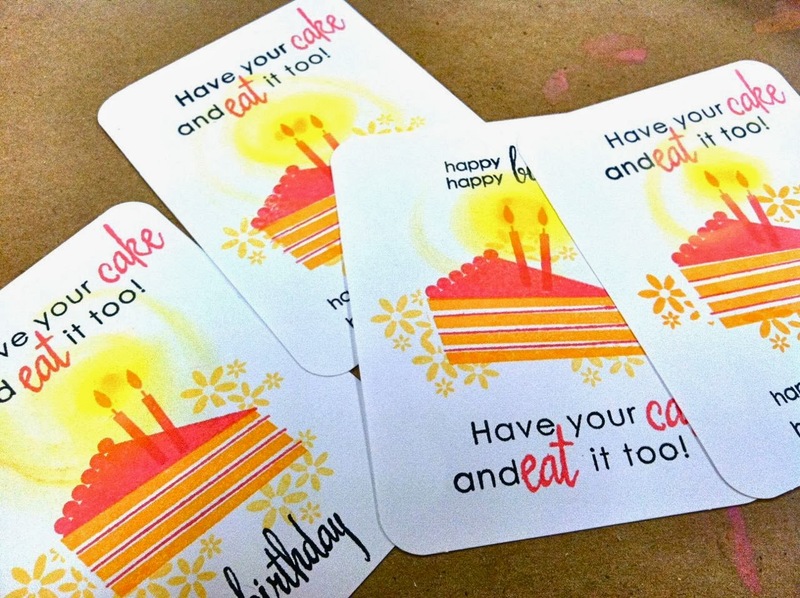 The card bases have been cut and folded for you. 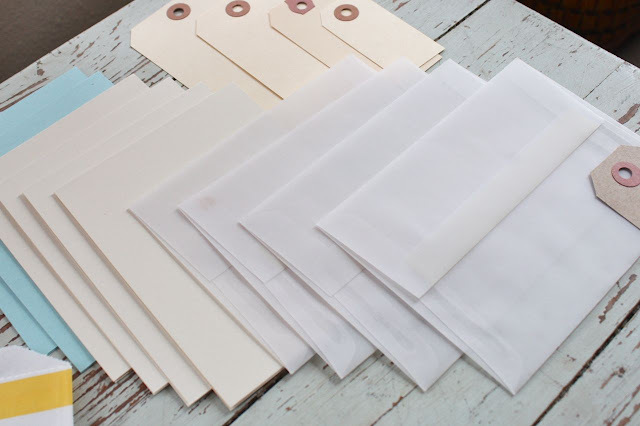 I included vellum envelopes for you to try out as I love being able to see the card front inside. There's a total of 4...the sacks are intended to be used for some card packaging too. 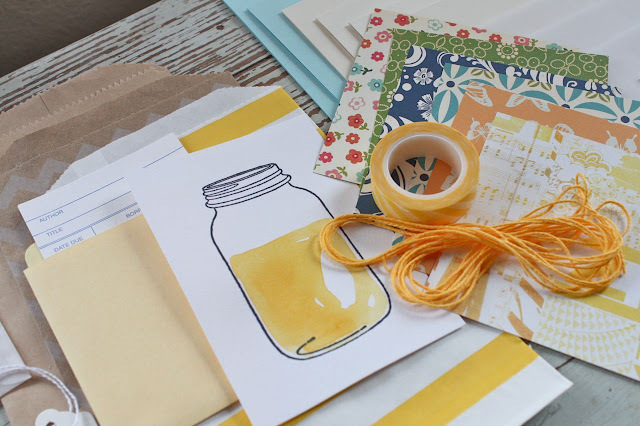 On to a few projects to show you how you can use the yellow jar. 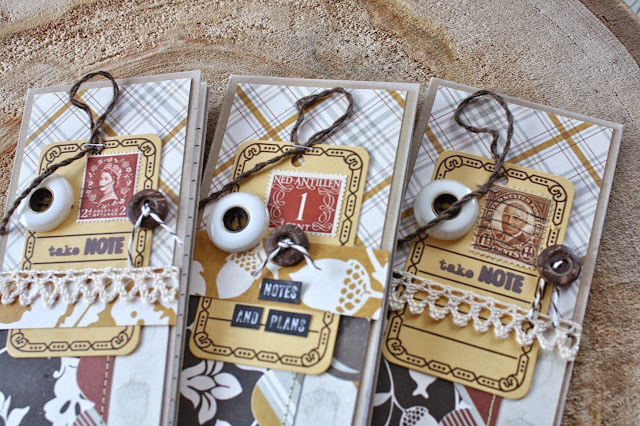 Here I made a gift sack that can be used to hold some cards as gifts, a single card or a small gift item such as a notepad or candy bar. I love the hints of yellow from the Washi (included in the kit), the yellow flower and the yellow stitching. 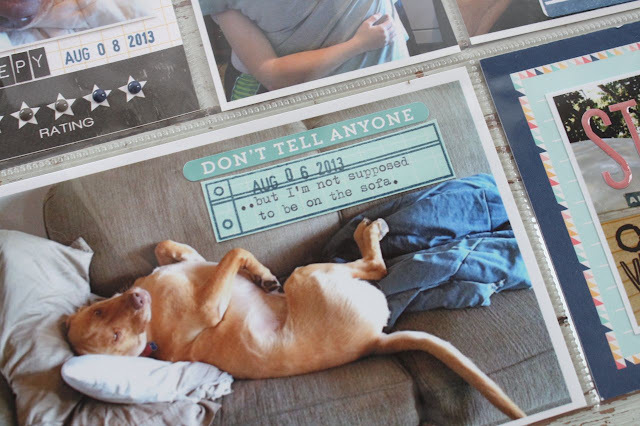 See that stamp...you just got a major sneak peek of the Life Pages stamp set from the September Gossamer Blue release coming up. 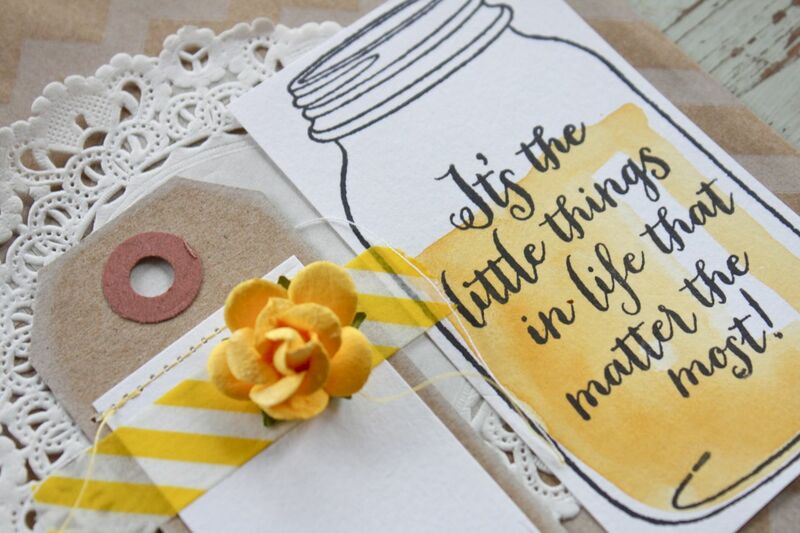 Just the sentiment, not the jar. I think the jar is from Inkadinkado. Here I cut around the jar to make a fun die cut popped up on the card. 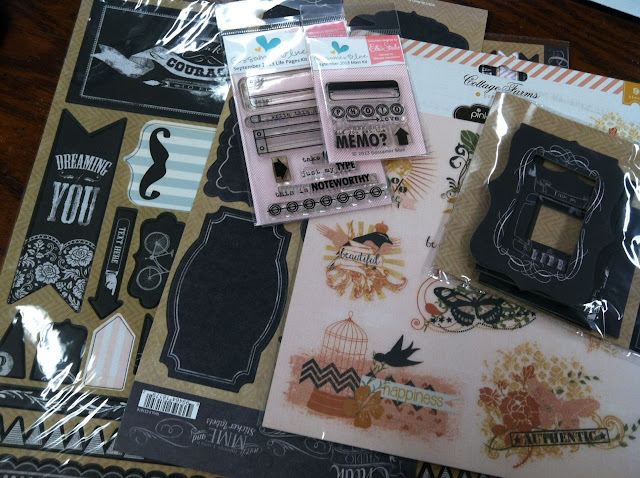 The papers and washi and all the other goodies are from the card kit. I love the layered tags with all the messy little trims and such. I typed the sentiment on my vintage typewriter. 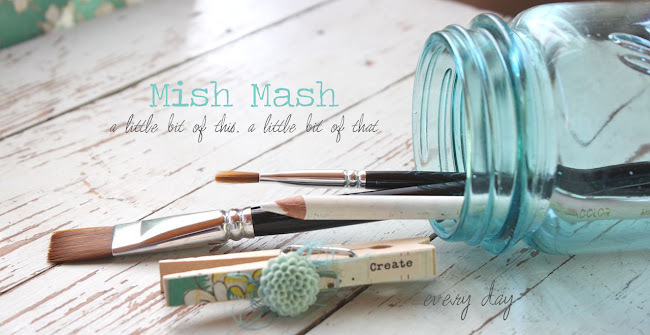 This next project would make a fun teacher gift. The packaging is a library pocket with a tag and another little surprise. 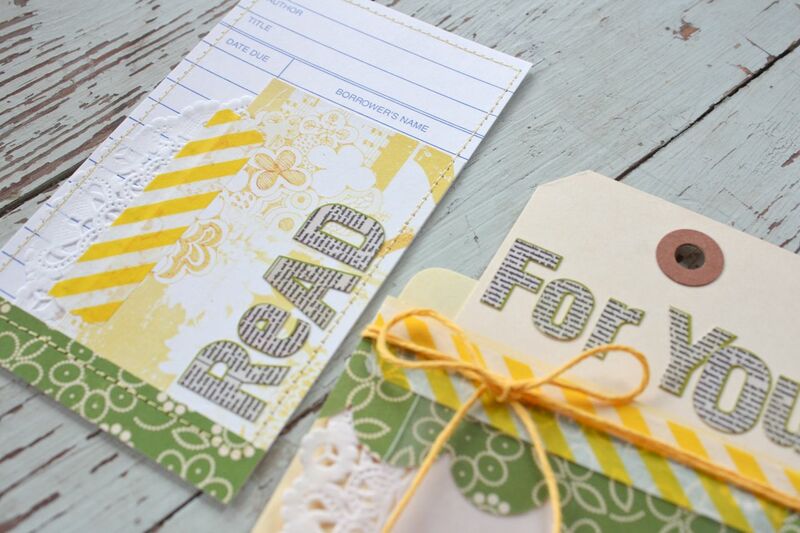 You take out the library card and it's a bookmark. 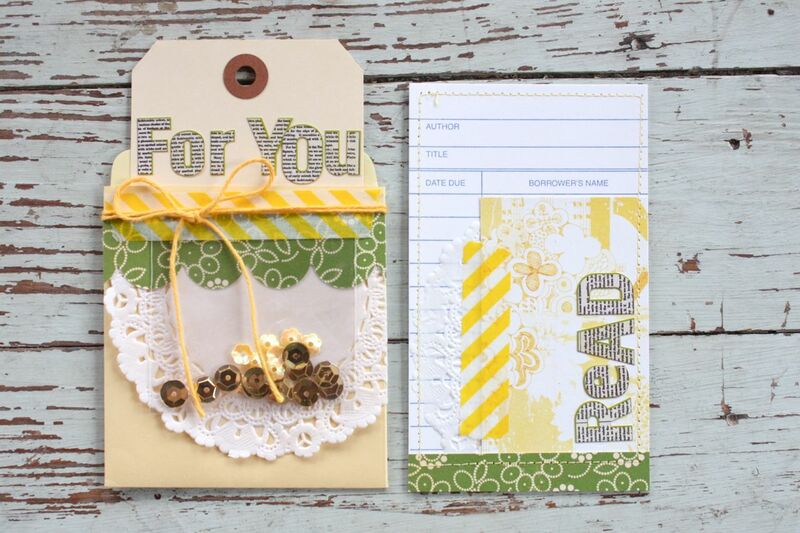 This can be used separately and the recipient is still left with a cute tag that stays in the pocket. You can write a fun message on the large manila tag. 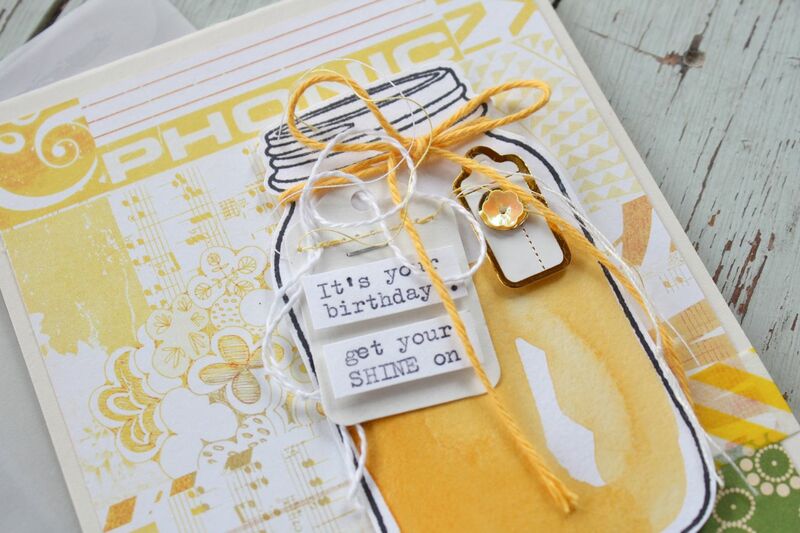 A clear sack with some of the sequins makes for a shiny finishing touch. Love the little snippets of Washi tape on all the projects. I used yellow stitching too on the library card/bookmark. Hope you enjoy! 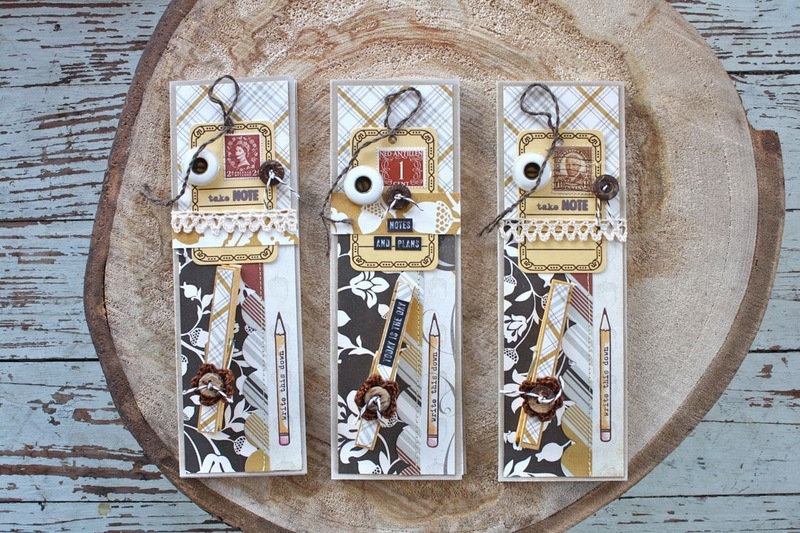 You can find the kit in the shop at this link. Thanks for stopping by.